My boy is a hockey player now, but for years his game was baseball. I got to thinking about this post the other day ~ it was a special one for me ~ and I thought I’d share it again for new readers. Another lesson from baseball today. My sweet boy had a game yesterday. From where I was sitting, I could hear the coach almost constantly, and I noticed how often he coached the boys to adjust their position ~ but only very slightly. In the outfield, he might have someone take two steps to their left… A catcher might be told to move a little closer to the batter… a batter might be told to inch closer to the plate, or closer to the pitcher. Each boy has his own tendencies, and it’s part of the coach’s job to recognize that, and teach each one accordingly. But we’re just talking a few inches here, how much difference can it make? Well, a lot, actually. If the catcher is closer to the batter, it enables the umpire to see the pitch better. When the pitcher is working his hardest to get the ball in the strike zone, you don’t want a good pitch wasted because the ump has a slightly distorted view. If you’re the batter, being closer to the plate is going to give you better reach on outside pitches. With a fast pitcher, a few inches back is going to give you a few precious extra milliseconds to see the ball, whereas with a slower pitcher, you’re less likely to miss the ball, by swinging too soon, if you are just a bit closer. In the case of outfield adjustments, it’s easy to realize that the coach has a better perspective than the players ~ if they are too close together, or if there’s a “hole” where a well-hit ball could do harm. So even if they are doing well, they could be doing better. It will make that boy a better player, and it will benefit the team. 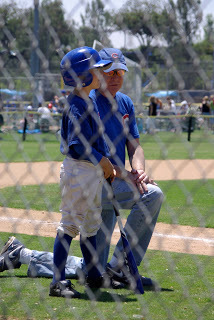 And one of the great side effects of the coach’s… well, coaching, is that the boys frequently seek his guidance. After every pitch, or every play, they look over at him to find out how they’re doing, and if there’s anything they need to know. I think this is a great way to think of our relationship with God. God loves us just as we are, but He does not intend to leave us this way. He sends trials our way, or lets us go through struggles, for the purpose of molding us. As a sculptor shaves off tiny imperfections, or as a coach makes minute adjustments in the position of his batter, so does God make changes in us that might seem imperceptible. He does this to make us more like Him, and as He does so, it often benefits those around us. We can make the process easier by looking to Him frequently. The more we check in with Him, the less He has to try to get our attention. The more we’re in tune with Him, the less painful it will be to make minor adjustments. A verse in Scripture; a sermon in church; the counsel of a friend…. He can use any of these to point out something in us that needs refining. Although, as with Little Leaguers, we might need to be told more than once! Keep your eyes on Him. He’s got His on you.